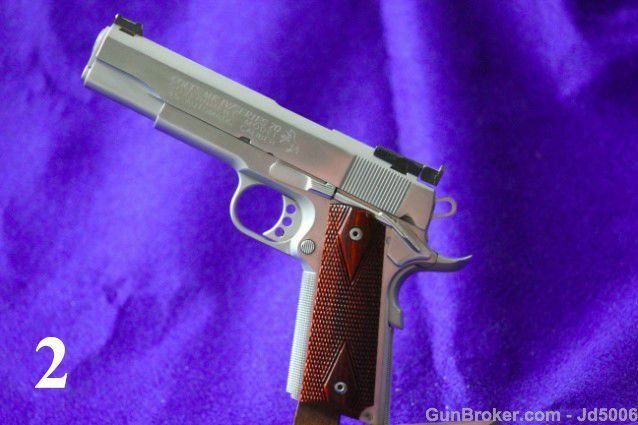 Caspian Gov't 1911 .38 Super. Schumana gain twist ported barrel. BoMar adjustable rear sight, low melted in slide. Cross dovetail front sight, fiber optic gold pin. Extended thumb safety, S&A beavertail grip safety. S&A mag guide, full length guide rod & reverse plug. Wilson Comcom hammer and sear. Caspian flat face skelentonized trigger with 3.5lb trigger pull. Front of grip frame, back of grip frame and S&A mag guide have tiger tooth surfacing. Hard chrome finish, brushed flats and matte rounds. S&A slimline Coco Bolo grips, scroll engraving on sides of slide, and sides and bottom of dust cover. 1 mag included. 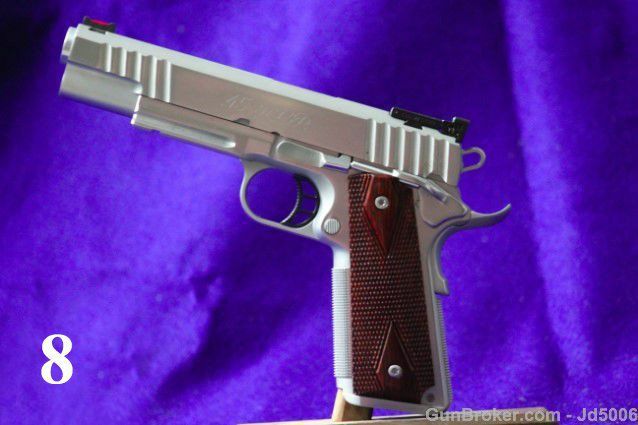 Colt Gov't 1911, .45 ACP. Series 70 slide. Caspian Foster frame. BoMar style rear sight, low melted cross dovetail fiber optic front sight gold pin. Barrel and bushing match fit. Novak ambi safety, S&A beavertail grip safety. Hand checkered front strap and main spring housing, 20 LPI. 3.5lb trigger pull with greided trigger and Wilson Comcom hammer and sear. Full length guide rod. Hard chrome finish, brushed flats, matte rounds. Coco Bolo double diamond grips. Caspian Foster 6" long slide, ported 10mm Barrel, hard fit. 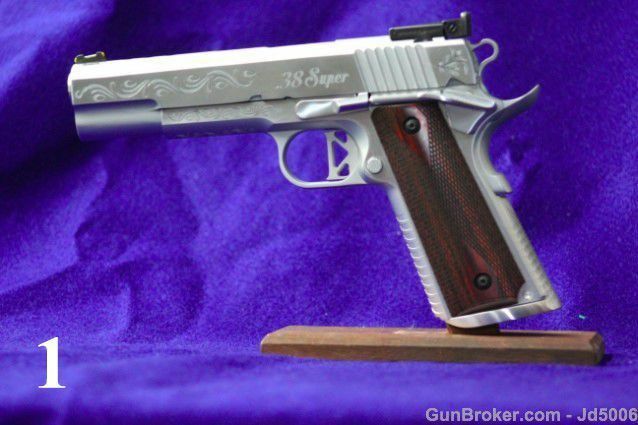 Addition 6 3/4 barreled .38 super compensated barrel. Wilson Comcom hammer and sear. STIL trigger with 3.5lb trigger pull. BoMar adjustable, low melt rear sight. Cross dovetail, gold fiber optic front sight. Extended thumb safety, S&A beavertail grip safety. Tiger tooth texturing on front and rear of grip frame. Scroll engraved sides and bottom of dust cover. Front of slide, has Game engravings on both sides. Custom ball bottom, rear cocking serrations. Double diamond Coco Bolo grips. Hard chrome frame assembly. burnt bronze cerakote slide. One mag for each caliber included. Caspian Foster 1911 Gov't STI DVC cut slide. 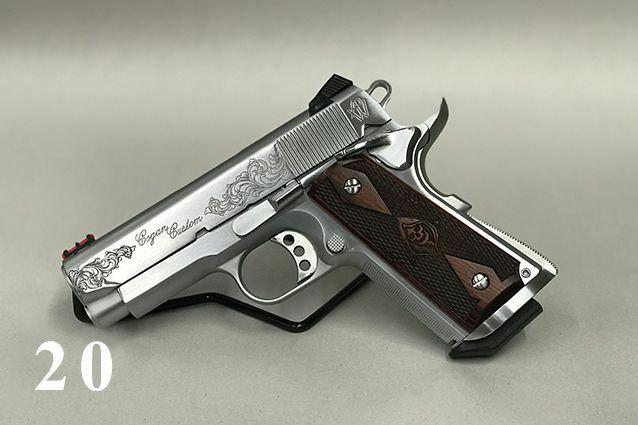 10 mm comped, .38 super comped, and 9 mm standard barrel. 1 mag for each caliber. Low melt BoMar adjustable rear sight. Cross dovetail fiber optic gold front sight. Wilson Comcom hammer and sear. Greider trigger with 3.5lb trigger pull. Wilson extended thumb safety, Wilson beavertail grip safety. Built in frame mag guide. Tiger tooth cut on front of grip frame, main spring housing and back of grip frame. Coco Bolo, checkered grips. Flats and bottom of dust cover with scroll engraving. Hard chrome finish, brushed flats and matte rounds. Caspian Foster STI Trojan Slide. Gov't 1911. BoMar style adjustable rear sight, low melt install. Cross dovetail red fiber optic front sight. Hand checkered front strap and main spring housing. 20 LPI, hard match fit Colt barrel and match bushing. Full length guide rod. Ambi thumb safety. STI beavertail grip safety. Wilson ComCom hammer and sear. Trigger pull is 3.5lb. Custom cut ball bottom cocking serrations on front and rear. Greider trigger. Hard chrome finish, brushed flats and matte rounds. Double diamond Coco Bolo grips. One mag included. RTW light weight alloy, compact frame. Officers length slide with compensated barrel. Extended thumb safety and S&A beavertail grip safety. Custom length arched, main spring housing. Checkered 40 LPI and front of grip frame checkered. 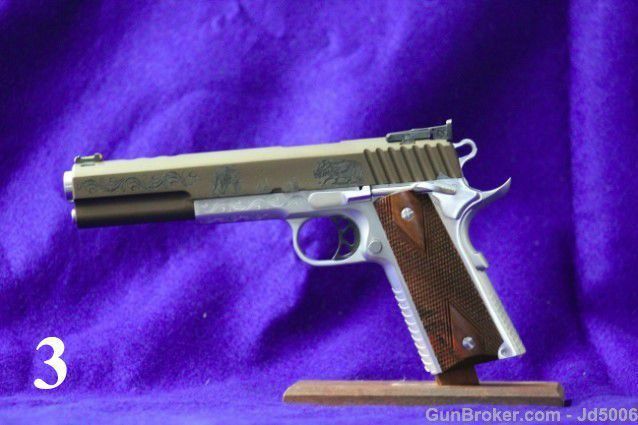 40 LPI custom sit slimline Coco Bolo grips. S&W adjustable, rev rear sight melted in slide. Cross dovetail, red fiber optic front sight. Custom built guide rod and recoil system. STI trigger and Wilson hammer. 4lb trigger pull. 6 mags included with this pistol. 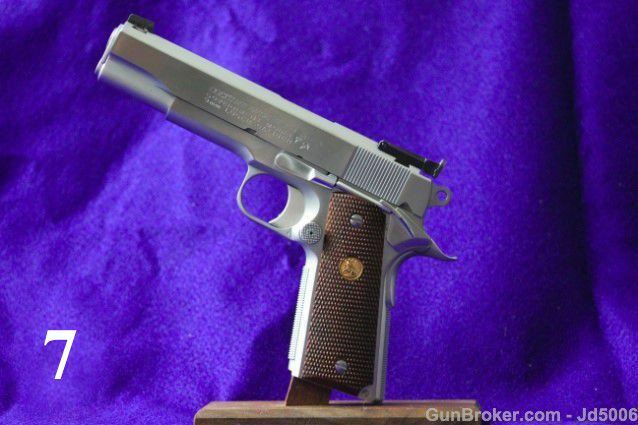 Colt 1911 Series 70 9 mm Gov't Model. Checkered grip frame and main spring housing. Extended mag catch and extended safety. Beavertail grip safety. BoMar style rear adjustable sight, low melt install. Aluminum trigger and trigger job. Full length guide rod. Hard chrome finish, brushed flats and matte rounds. One mag included. 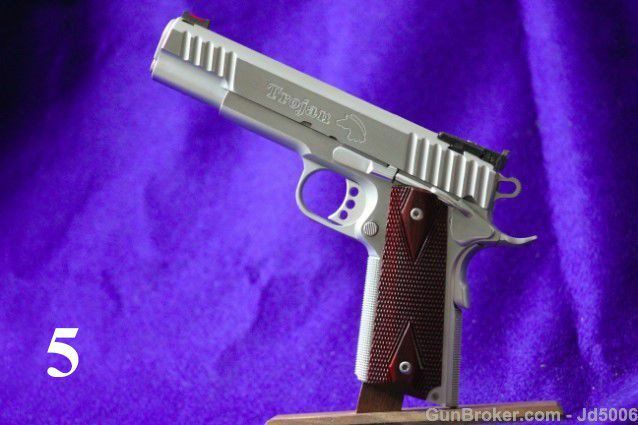 Caspian Gov't 1911 .45 ACP Recon. BoMar style, green fiber optic rear sight, low melted install. Cross dovetail, red fiber optic front sight. 20 line per inch checkering on front of grip frame and main spring housing. Frame expanded mag well flair. Extended thumb safety and S&A beavertail grip safety. Wilson Combat Com hammer and sear. STI trigger with 4lb trigger pull. Match grade, hard fit bull barrel, full length guide rod and reverse recoil spring plug. Top of slide, lined 30 LPI. Custom ball bottom, cut cocking serrations on front and rear of slide. Hard chrome finish, brushed flats and matte rounds. Double diamond Coco Bolo grips. One mag included. 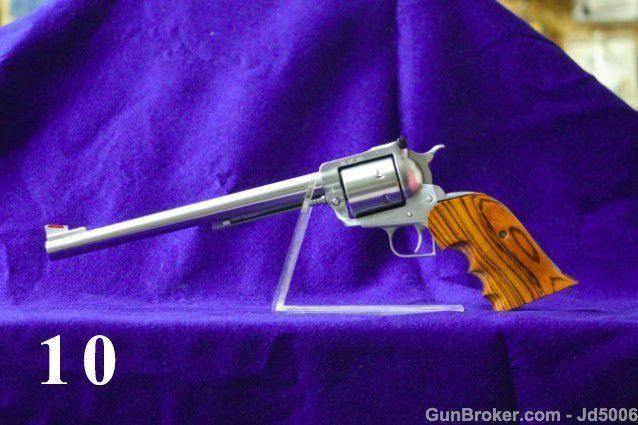 Ruger 10 1/2 Super Blackhawk .44 Mag. Brushed hard chrome finish. Action job completed by Bob Cogan. Orange front sight insert. Hogue over sized finger groove grips. 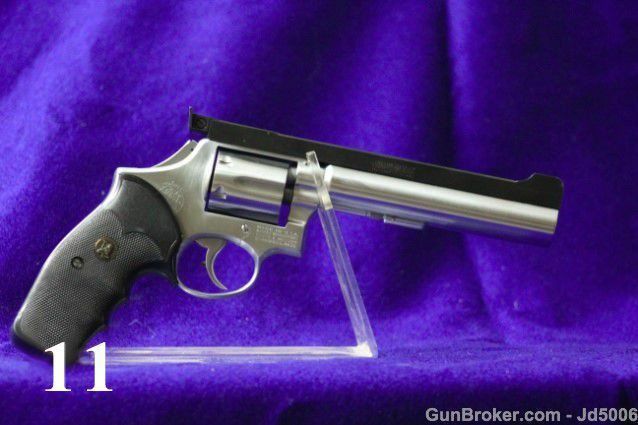 Smith & Wesson Model 10, Cogan Custom 38 Special PPC Bull Barrel Revolver. 6" Douglas air gauge barrel, 1 in 14 twist. Smooth, double action only trigger with bobbed and contoured hammer with overtravel screw. Smith & Wesson style front cylinder lock up. Brushed hard chrome finish. Aristocrat sight Rib and pachmayer grips. DS Arms custom AR-15. 16" barrel with flash hider, 223 Wildey Chamber. Standard front sight. Flat top receiver with picatiny rail. Add $30.00 for rear right to be mounted and adjustable. Cogan Custom 98 Belgian Mauser. .308 Winchester. Bob Cogan built this rifle for himself. Other than mounting a scope and checking the rifle for accuracy, which was sub minute of angle. He put about 30 rounds of National Match ammo, on the range only. 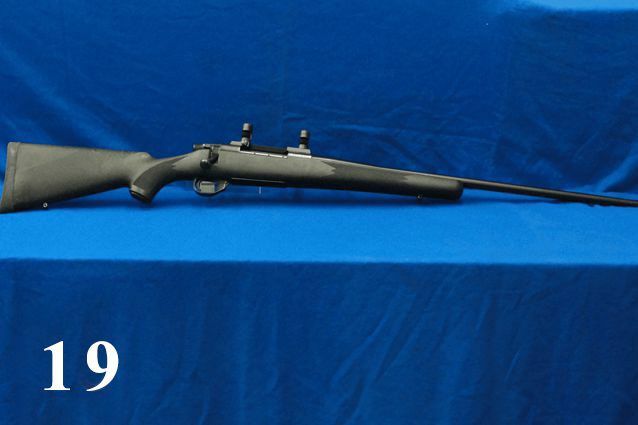 The rifle has a McGowan barrel match grade, hand fitted to the receiver. A timney light weight deluxe trigger, set at 2.5lb pull. Custom modified bolt handle to clear the scope and customized bolt head. It is set in a Hogue over molded stock, fully free floated Leopold bases are already installed, and the steel parts are finished in AP&W INC splattered cerakote finish. This finish kinda disappears in the woods. 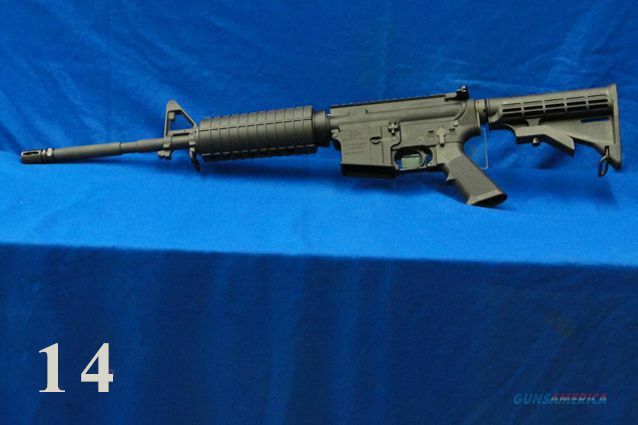 $1,250.00 is a steal of a price for the custom rifle. Bob has that much just in parts. Custom built on light weight 7075T6 Fusion Frame, with STI Steel Master Slide. 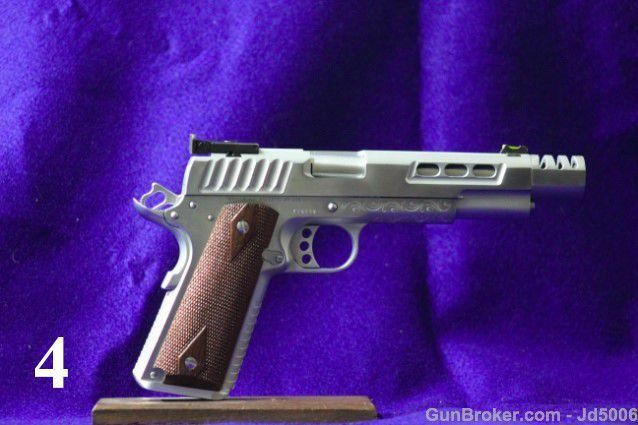 This pistol screams speed, Worldspeed that is! The pistol is totally hand fitted. It weighs; Empty, 33oz., with the C-more reflex dot and base. With the dual chamber, dual port comp system, the dot barley moves in rapid fire. 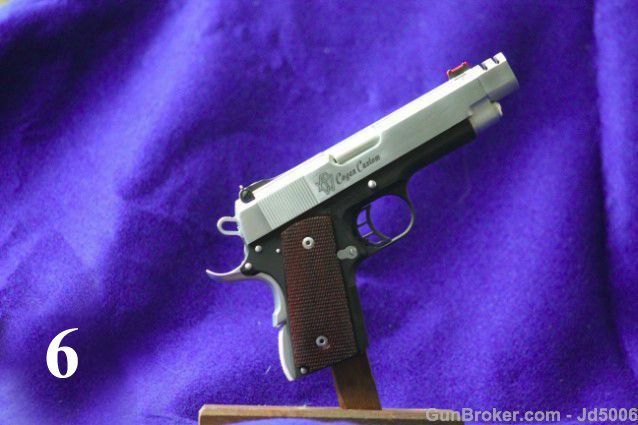 Pistols like this, usually cost $4,000 or more! 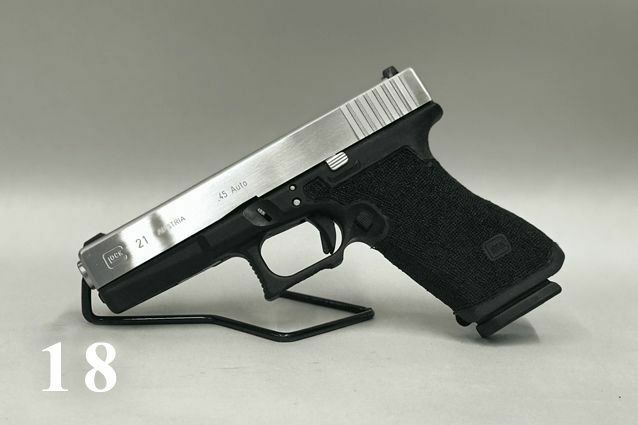 This one can be yours for $3,499, with 5 Mags included! The C-More on this pistol, and the mounting system allow for no potential ejection hang-ups from empties contacting the scope base, or scope. sear, Greider trigger, trigger pull 4# match grade and fit full barrels, reverse plug and full length guide rod. Hard chrome finish, brushed flats, matte rounds, COCO Bolo double diamond gips. Comes with one mag. Fiber optic sights: Green rear, and red front. Trigger pull adjusted 3 ½# crisp. Slide and barrel ported to reduce recoil and muzzle flip. It’s very fast on double and triple taps. Slide and steel parts are hard chromed brushed flats, matte sight surface. Grip frame has been received and retextured for more positive and controllable grip. 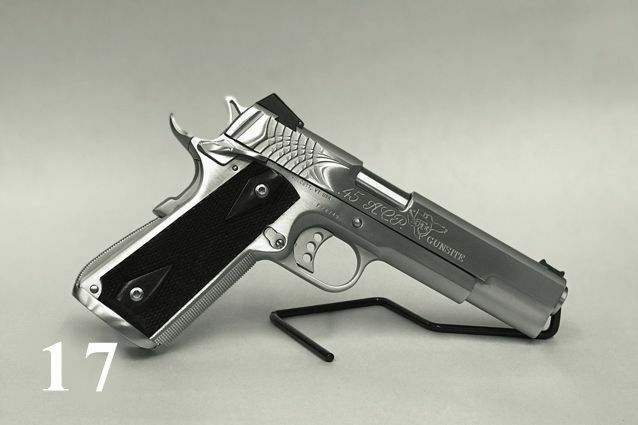 This pistol is ready for any task it's chosen to perform. Also includes one mag. 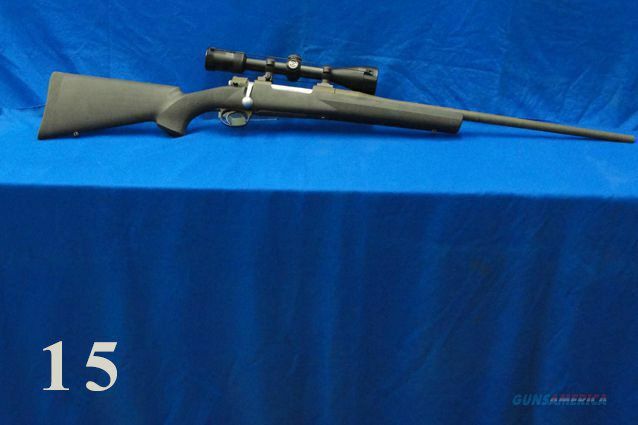 Weatherby Mag Bolt action rifle, 3lb trigger pull. Polymer stock, hinged floor plate, Leopold base and 1" rings. Original blue finish. This rifle is like NEW. 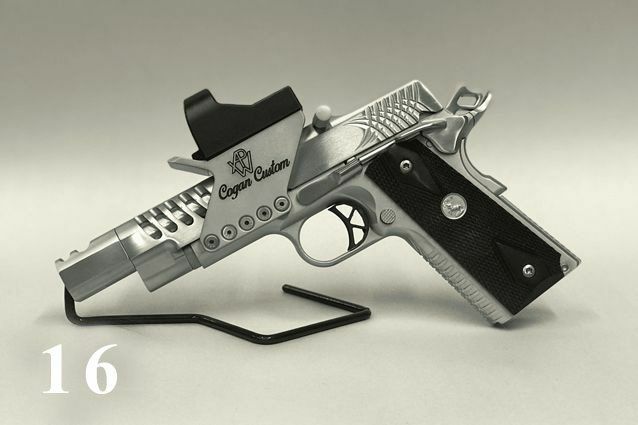 Caspian Foster stainless steel frame, with fit Colt officer slide. Custom fit S&A beavertail grip safety and mag guide. Greider match grade trigger, set to 4lb pull. Match grade fit ejector, tuned extractor and STI thumb safety. Match grade fit barrel. Kensight adjustable rear sight and Novak cross dovetail, fiber optic front sight. Wilson flat spring recoil system and rod, with custom reverse recoil spring plug. Wilson hammer and sear, with Nowlin sear spring. Dual ported slide and barrel. Checkered front of grip frame and mainspring housing at 20 L.P.I. The back of the slide is liked at 40 L.P.I. Custom engraving on the slide, with a hard chrome finish, brushed flats and matte rounds.